Around the world archaeologists and historians are documenting sea level rise impacts on archaeological and historical sites and creating projects to protect them or to gather as much information as possible before they wash away. 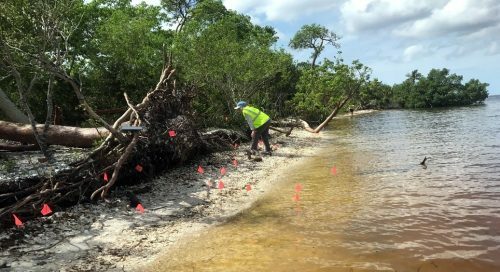 One such project was first reported in our June 2016 newsletter when Karen Walker, Jennifer Haney, and Bill Marquardt described the Calusa Island North Beach Archaeological Monitoring Project. The Florida Public Archaeology Network (FPAN) joined the project in August 2017, just before Hurricane Irma made landfall on September 10, 2017 at Marco Island, approximately 60 miles south of Calusa Island. Calusa Island is located on the northern end of Pine Island, much of it is owned by the Calusa Land Trust who have provided support for this work. Historic photographs and reports of residents demonstrated a loss of 30 to 40 feet of then midden from the 1970s to the time the project began. North Beach contains shell midden from the Late Archaic (1200 – 500 BC), a time period which is poorly understood in our region. 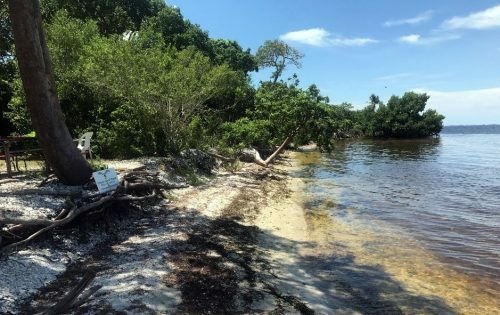 Calusa Island North Beach midden before Hurricane Irma. The project uses rebar rods installed as fixed points from which we measure the distance to the edge of the midden. With erosion, measurements from the fixed point rod to the midden edge will decrease and the rate of change can be determined. The rods also serve to divide the roughly 300 feet of beach into 8 sections. To refine early methods, we began using a compass and a plumb bob and pin flagging all artifacts that were to be photographed, mapped, and catalogued. We also adapted methods to record undercuts created when the top surface of the midden extends further than the bottom where water can reach. This change is providing information important to understanding erosion processes. All data is carefully recorded in the field and entered to a Google Docs catalog by team members consisting of FPAN staff and trained volunteers of the RRC. Calusa Island North Beach after Hurricane Irma. In total, the team has made 15 visits, with 7 between August and November of 2017 and has documented an average of 19.7 cm (7.75 inches) of erosion, with some sections seeing a loss of 64 cm (25 inches). Hurricane Irma caused a significant impact as violent surf tore away as much as 39 cm (15.35 inches) in one area while also depositing 16cm (6.3 inches) of sand in another. Intense winds felled a large gumbo limbo tree exposing artifacts that were once safe under its roots. Our most recent visit on September 2018 showed that a significant amount of shell has been re-deposited on the beach, creating a berm of sand that is beginning to sustain small mangrove propagules. Mangroves help protect sites from wave energy and thus are a welcome addition. Continued monitoring will tell if these propagules continue to grow or are swept away by wave action or another storm.